A brilliant .48 carat, H-I color, Vs2 clarity oval cut diamond glows from the face of this antique style engagement ring. 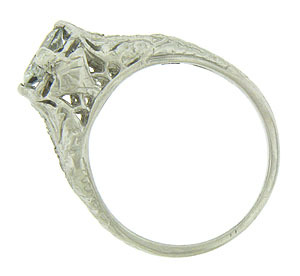 Intricate organic cutwork and engraving cover the surface of this remarkable ring. Trios of fine faceted diamonds drape down the rings shoulders. 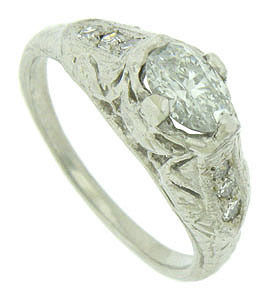 Fashioned of platinum, the ring measures 6.62 mm in width. Size 6. We can re-size.